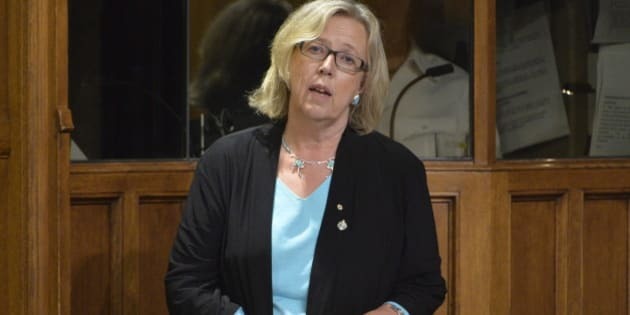 Green Party Leader Elizabeth May says she understand the good "intentions" of Prime Minister Stephen Harper in calling for airstrikes against the Islamic State of Iraq and the Levant. But she wants more than a day of debate and cautioned her fellow MPs Friday to look closely at the lessons of history. Mr. Speaker, with that, let me convey my thanks to all members of this House for the rare unanimous consent to allow a member from an unrecognized party to respond, although I do stand here recognized as a member of Parliament for the Green Party. I want to reflect very briefly on the fact that in June 2011, I was the only member of the House to vote against the continued bombardment of Libya, recognizing at the time, as I said in debates, I was deeply troubled by the fact that among the rebel forces we were supporting was al-Qaida and there were warehouses full of arms that could easily end up in the hands of extremists and inadvertently fuel terrorism. I do not stand here to say for one moment that I was right and all members were wrong. That is not my point at all. We were united in our concern as Canadians to do the right thing. However, in this region of the world, if there was ever proof for the adage that the road to hell was paid with good intentions, we have it in spades from the U.S. deciding it would be a bright idea to recruit a millionaire named Osama Bin Laden to take on the threat of the Soviet presence in Afghanistan, create al-Qaida, and hope that when they went through somehow Afghanistan could hold it together. Then we went back into Afghanistan, and then we had the ongoing crisis of terrorist organizations. We had what happened in Libya. In June 2011, the Minister of Foreign Affairs said, "Obviously, no government can be worse than the Gadhafi regime". I think the road to hell was paved with good intentions again in Libya because we meant well, but in turning down peace offers and peace talks and pursuing a bombardment we inadvertently increased the strength of terrorists. I just wanted to add this one thought because I know we are all pressed for time and I appreciate the opportunity and the honour to speak with all members. I completely support what the prime minister said, that Canada cannot stand on the sidelines. In every single town hall meeting I had earlier in September, my constituents and residents of my communities opened by saying: what do we do about this terrorist threat of ISIL; what about ISIS, it is horrific? My response to them was this. We need to sign the arms trade treaty. We need to stem the flow of conventional arms to terrorists. We need to track the money. We need to find out who is fuelling these people. We need sensible plans. We need to make sure that there are not vast numbers, cohorts of unemployed young men, who feel alienated within their societies. If this is called practising sociology, consider me guilty of it. I call it thinking. We need to speak. I completely support all of the prime minister's intentions. We cannot allow these horrific crimes to go unanswered but we must make sure whatever we do does not make matters worse. That is why I hope we will have a fuller debate for more than just one day so that we can bring to bear the collective knowledge and wisdom of Canadians, every single one of us in this place representing constituents who want Canada to do the right thing. I do not think we are there yet. Without disrespect to any of us, bombings have never ended an Islamic or any religious extremist terrorist threat. Time after time it has made matters worse. Let us try to look to the lessons of history before we go to war again.